btc | Conformal Systems, LLC. Coinvoice has added the ability for merchants to have their customers pay in BTC and receive a USD payout, similar to other BTC payment processors. 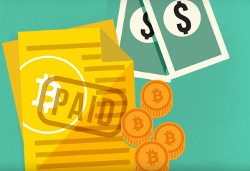 This means that Coinvoice merchants can bill their customers in BTC and receive USD or bill in USD and receive BTC. Our goal is to provide the most flexible set of payment options for merchants so they can focus on making sales rather than converting between BTC and USD. I am excited to announce Coinvoice, a new Bitcoin payment processing service that allows businesses to invoice for goods and services worldwide in U.S. Dollars (USD) and get paid in Bitcoins (BTC). Coinvoice makes it easy for any merchant to receive BTC without them or their customers having to worry about the infrastructure necessary to conduct and process these transactions. So long as the merchant’s customers can pay in USD via wire transfer, certified check or money order, Coinvoice will pay out to the merchant in BTC. The idea for Coinvoice arose out of a handful of conversations I had regarding Bitcoins and receiving payment for invoices using cryptocurrencies more generally. I had remarked to one of my associates that “it would be great to take payment for invoices in BTC”, but I acknowledged that it was a serious pain point to dictate to all of your customers “now you need to go get BTC to pay me”. Then I went on to suggest I would be willing to give a discount on the invoice amount if they paid in BTC, and the seed for Coinvoice was sowed. Beyond making a business out of the scenario I described above, Coinvoice is meant to fulfill a vital need in the Bitcoin economy: putting BTC in the hands of business owners with less friction. Enabling businesses to more easily access BTC is overall a positive thing for the Bitcoin economy, and it will have positive secondary effects, e.g. more customers for sites that accept direct BTC payments. More generically, Coinvoice is meant to enable payment settlement from USD to BTC, whereas most existing payment processing services are built to facilitate settlement from BTC to USD or solely in BTC. Coinvoice is meant to be used in a “traditional” business setting where invoices are issued and paid a number of days afterwards. We are looking forward to enabling businesses to settle payments in BTC and helping grow the larger Bitcoin ecosystem. Coinvoice provides you with a safe, private, reliable and secure way for your business to receive BTC.